Rationing is a vital part of your country's war effort. Any attempt to violate the rules is an effort to deny someone his share and will create hardship and help the enemy. This book is your Government's assurance of your right to buy your fair share of certain goods made scarce by war. Price ceilings have also been established for your protection. Dealers must post these prices conspicuously. Don't pay more.Give your whole support to rationing and thereby conserve our vital goods. Be guided by the rule: "If you don't need it, DON'T BUY IT. "US Government Printing Office 1943. The ration book "SAFTEECASE" soilproof family holder. It's hard to imagine "war rationing", isn't it? We could learn alot from this couldn't we. If you don't need it don't buy it......so true. I'm so glad you stopped by my blog! These ration books are a wonderful piece of history. I can just imagine what folks in 2012 would think if they had to sacrifice. I look forward to following you blog! Yes! In this day and age and in this world of consumerism, the idea of war rations is unimaginable! Although, I do believe that it would do us all some good! Very timely post! It is hard to imagine what our ancestors went through during those times. My grandma had lots of stories of how they made do with less. Do you remember the gas rationing scare in 1978-79? I have some that were my gransdparent's. They lived and worked in Oak Ridge, TN, the city behind the fence. That's one of the locations where things were produced to make the atom bomb. Papa was a fireman and Nana was a guard. My mother was a pre-teen, teen during that time. Not an easy life but better than it was during the depression. That is a pretty cool keepsake really. What a piece of history. No, I cannot imagine rationing. But the idea of 'don't buy it if you don't need it' I really do need to employ more often!! LOL! How wonderful you have them! How neat. That's a real treasure. 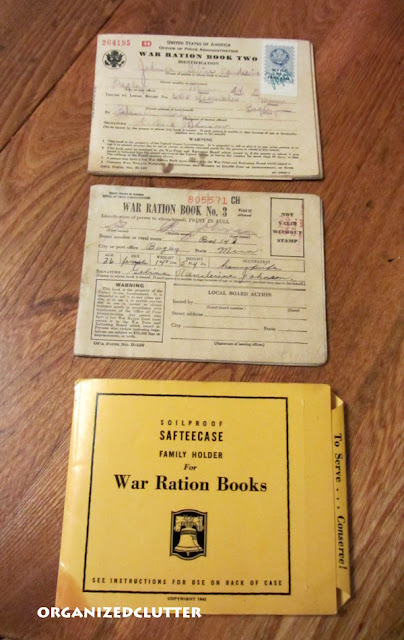 My husband lived through rationing in England after the war as a child, and his family had lots of stories. Very difficult to be a homemaker then. What a fascinting post...I hope we never return to those days. Thankfully it is hard to imagine. I loved being able to see these! We've heard about these our whole life but I'd never seen one. Thank you for sharing. so interesting to see these! I have often read about this (either in older USA or English novels ) but its great to see a visual! Love this series your doing! Absolutely love it! My mom was a child during the war and had told me about the rationing. We are spoiled nowadays. So cool you have all these old books. My parents remember the ration books from during the war and my grandpa was an "air raid" patrol man. He had to walk their Chicago neighborhood every night and make sure everyone had their windows blacked out. Stopped by from Sunny Simple! In the last couple of years I've been able to pick up some Canadian ration books to add to my Remembrance Day window display. I find them intresting and was surprised my 19 year old nephew found them intresting to. Your copies are great. I remember similar books that my grandmother had and my mom certainly remembers using these. Such hard times our families went through back then.